We don’t need to tell you much about Puss in Boots from Dreamworks. “The Most Interesting Cat in the World”, his mini-trailers have gone viral all over YouTube and elsewhere already. So we’ll just clue you in on a few interesting factoids. The movie stars Antonio Banderas (of course!) 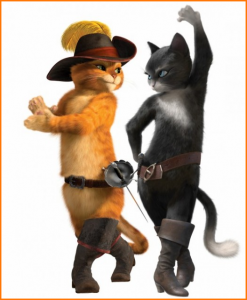 as Puss and Salma Hayek as the curvaceous Kitty Softpaws, as well as the voices of Zach Galifianakis, Billy Bob Thornton, Amy Sedaris, Constance Marie, and Guillermo del Toro. It’s directed by Chris Miller, who’s an old hand at Dreamworks by now: Besides having directed Shrek the 3rd, he’s also known as the voice of Kowalski the penguin in the Madagascar movies. (Popular voice actor Jeff Bennett voices Kowalski in the Penguins of Madagascar TV series though. Back in the day, Chris Miller was also very well known for an animated short he created, Lea Press-On Limbs.) And of course, the most important news: It’s coming to theaters on Friday, October 28th. Right after seeing the movie, you might want to check out The Art of Puss in Boots, edited by Ramin Zahed and available in hardcover this November from Insight Editions. There never seems to be enough of these, and frankly that’s just fine with us! 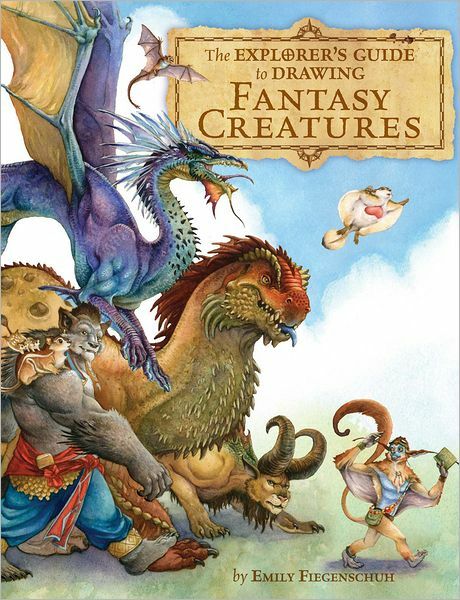 The Explorer’s Guide to Drawing Fantasy Creatures is a new hardcover art instruction book, written and illustrated by Emily Fiegenschuh. She holds a degree from Ringling College of Art & Design, and in the past she’s illustrated numerous Dungeons & Dragons rulebooks for Wizards of the Coast. Now her new book (published by F + W Media) guides the would-be fantasy artist through not only rendering fantastic creatures of myth, legend, and nightmare, but also breathing life into the finished pictures. According to the publisher’s notes, the book includes: “25 step-by-step demonstrations for creating a bevy of beasts that roam air, land and sea; important basics of drawing, proportion and perspective to help you bring believability to your creatures; instruction for adding living, breating color to finished sketches; and expert tips on finding inspiration, developing personalities, designing costumes and more”. It’s on the shelves now. Catching onto what seems to be a growing trend (we know, we know: When wasn’t it? ), Vanguard Productions now brings us Art of the Dragon in paperback this November. Here, we’ll let them tell you about it: “Vanguard presents every dragon lover’s dream come true, Art of the Dragon: The Definitive Collection of Contemporary Dragon Paintings. This concise yet comprehensive survey by Visions of Never author Patrick Wilshire and How to Draw Chiller Monsters, Werewolves, Vampires, and Zombies author J. David Spurlock presents and examines the ultimate collection of contemporary dragon paintings and provides insights about the foremost dragon-painting fantasy artists including Jeff Easley, Larry Elmore, Clyde Caldwell, Keith Parkinson, Todd Lockwood, Donato Giancola, John Howe, Bob Eggleton, Don Maitz, Stephen Hickman, Boris Vallejo, Julie Bell, Greg Hildebrandt, and record-breaking Hugo Award winner Michael Whelan, who also provides the cover to this long-awaited and breath-taking compendium. This book is dedicated to the memory of the late, great fantasy artist Jeffrey Catherine Jones who passed away May 19, 2011.” There’s more information about the book on Amazon. If you don’t know who some of these artists are, you should! Go on and Google them right now. 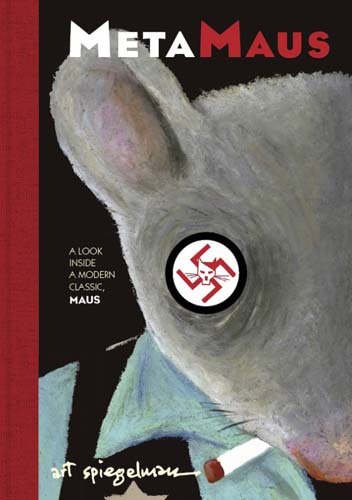 Considered by many critics and fans to be one of the most significant (as in, socially relevant) anthropomorphic works of the 20th Century, Art Spiegelman’s Maus: A Survivor’s Tale brought us the story of a Jewish family struggling to stay alive and together in the horror of Nazi Germany during World War II. And it did so through the medium of funny animal comics — but oh, were funny animals ever so not funny… In the years since the publication of Maus (and after numerous awards), Art Spiegelman has been hounded by questions: Why the Holocaust? Why mice? And why a comic book? Now, he attempts to take those questions head-on in his new hardcover book, Metamaus: A Look Inside A Modern Classic, Maus, which is available now from Pantheon Books. The book and accompanying DVD not only include an on-screen version of The Complete Maus, but also interviews with the creator’s father, memories of his mother (both his parents were held prisoner in concentration camps) by folks who knew her, scholarly essays on Maus, loads of background sketches, and much more. 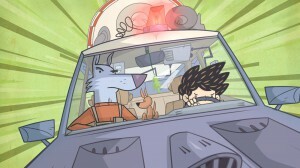 “In the wild future, where weird science and natural wonders walk hand in hand, a boy and his dog decide to take a stand as the last, self-appointed supercops…” That’s the tag-line of Patrick & Theo, a new animated TV series in development, created by Ervin B. Nagy, Marci Nagy, and Marton Kovacs (all from Budapest, Hungary). 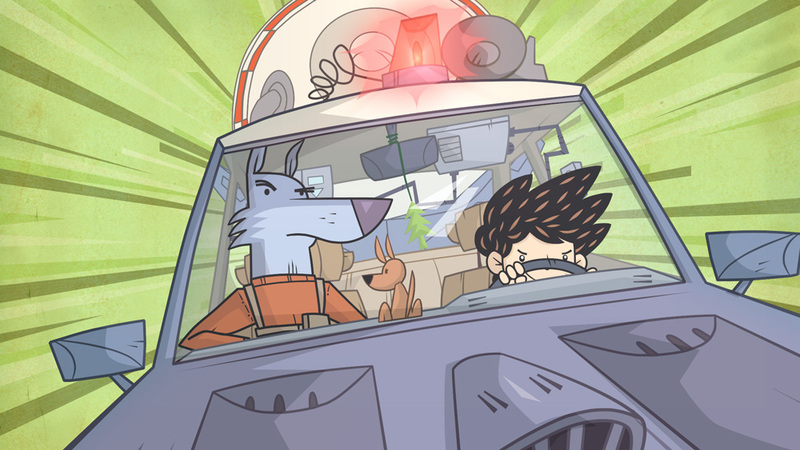 It tells the story of Patrick, a 10-year-old boy with a crime TV show obsession, and Theo, Patrick’s mutant anthropomorphic dog and guardian. The creators have an extensive web site, which includes links to various YouTube videos (like this one and this one) that introduce you to the characters and their wild world.